Anyone who spends any time Googling WDW food options is bound to come across references to Tonga Toast, the reportedly magically delicious breakfast item available at the Kona Cafe in Disney’s Polynesian Resort. So on our recent trip back to Disney, courtesy of a giveaway from DizDiva.com and Magic Carpet Travel (yep, that’s Steve Thibodeau from MCTravel and the MouseChow clan), I was intrigued enough to schedule a special trip over to the Polynesian just to check it out. You know, taking one for the team and all. 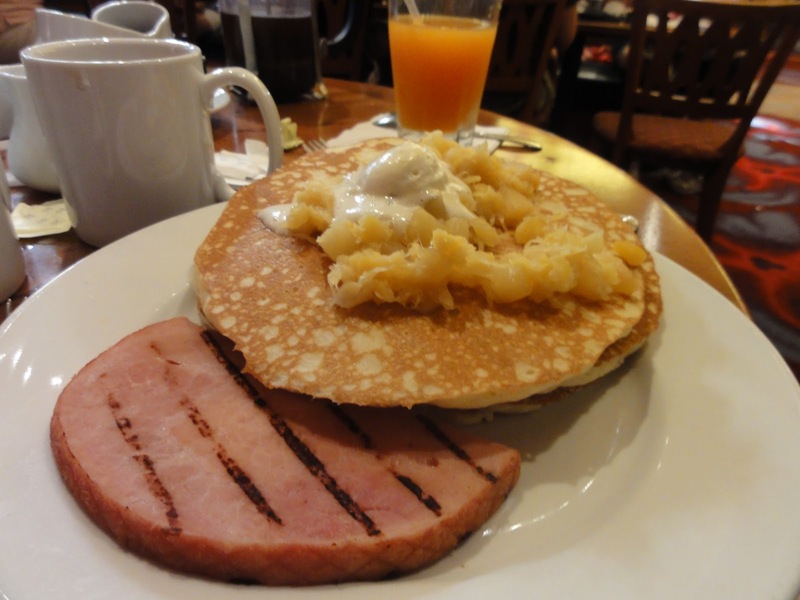 First, you need to know how important it is to make Advanced Dining Reservations for breakfast at Kona Cafe. It is unbelievably popular. You’ll be competing for a seat with resort guests as well as those who visit the resort just for breakfast. On Saturday morning in mid-December the wait was over an hour for drop-ins. We walked up 15 minutes prior to our ADR, were handed a buzzer, then poked around the shops for 10 minutes before being called for our seat. OK, so what the heck is Tonga Toast? I was still confused when it arrived. Here’s the scoop. It is a gargantuan piece of sourdough bread, stuffed with banana, cinnamon, and brown sugar, dipped in egg (like French toast), then fried, and coated in cinnamon sugar. It bears a passing resemblance to an Easter Island head, until you pour on the strawberry compote. Then it’s more like an Easter Island head who’s been bludgeoned. “But MouseChow,” you may ask, “is it delicious?” Well…maybe you will like it. Certainly many, many people do. I wasn’t in love with it. The bread is really too thick for the egg custard to penetrate, so the interior is pretty dry except for the one slit cut in the side where the bananas are hiding. They weren’t distributed through the toast. This left one pocket of deliciousness, and a large piece of dry cinnamon toast. The ham was excellent, though. Mr. MouseChow had the Macadamia Pineapple Pancakes. These were good, and also very sweet. Mr. MC ate them with the strawberry compote rather than maple syrup. The tartness of the strawberries were a nice contrast to the very sweet pineapple. But look at that ham! 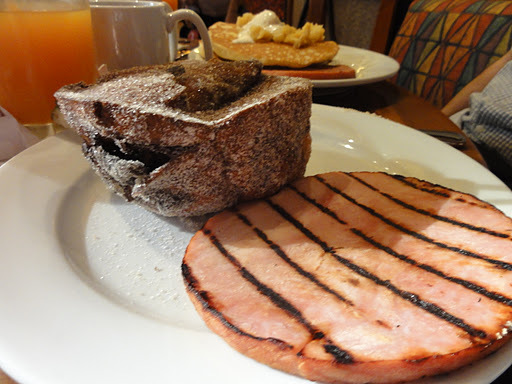 If we had only ordered the Tonga Toast and pancakes, we would have left slightly disappointed. BUT, our mini-MC ordered The Samoan. Ahhhh…the Samoan. Pulled pork hash (yes, that’s right! 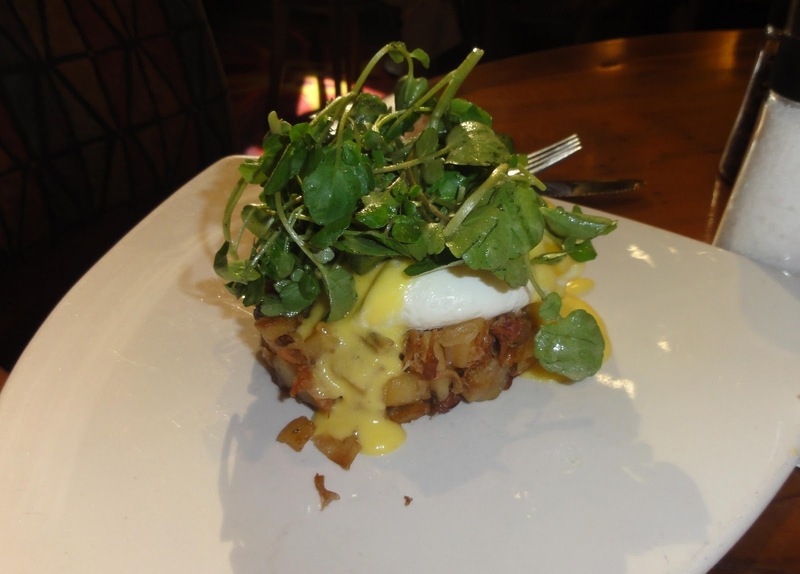 ), topped with two perfectly poached eggs and real Hollandaise. Our kiddo pushed the watercress to the side, and dug in. Thankfully it was way too much food for her, so I got to eat about half. I’m still dreaming about the Samoan. Next time we order barbeque, you can bet I’ll be saving some pulled pork for breakfast the next morning. The beverages at Kona Cafe bear mentioning. We splurged for a French press of Kona coffee. Easily the best coffee we had during our trip. Skip your regular OJ and go for the Lilikoi juice – a delicious blend of orange, passion fruit, and guava. 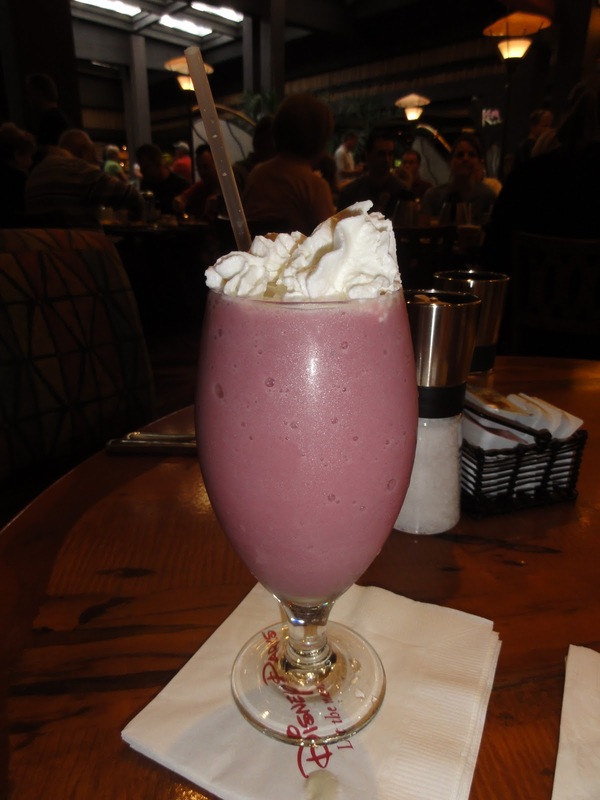 We also tried the berry smoothie, chock full of vitamin B and Omega 3s. Good stuff. Any change to that equation may produce a different result. What do you think? Was your experience with Tonga Toast different from mine? Let me know in the comments!